The possibility of an impending bear market means that investors should be risk-on and prepared to hedge against short-term pullbacks. They should continue to invest in equities, particularly growth stocks, as well as companies with healthy balance sheets, say fund managers. 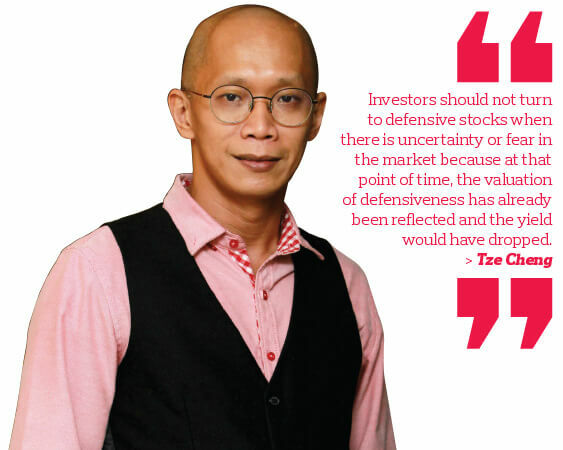 Lim Chia Wei, portfolio manager at Affin Hwang Asset Management Bhd, is of the view that quality stocks with high returns on investment capital and stable cash flow could help long-term investors trudge through the market conditions. “It is time to be more prudent and selective. Let’s say that in the past you did not mind buying a highly indebted company because it was delivering decent growth and could cover its debt obligations. This year, you have to be more prudent,” he says. There is still a strong case for equities going into 2019, says Lim Suet Ling, CEO of UOB Asset Management Bhd. Equities will continue to be supported by above-trend global growth, strong leading indicators and double-digit corporate profit growth, she adds. The earnings per share (EPS) growth of the MSCI All Country World Index, for example, is expected to be 15% year on year. “We are still at the late part of the economic cycle. Until the cycle fully matures, we think a higher stocks-to-bonds ratio should be the way to go,” says Suet Ling. 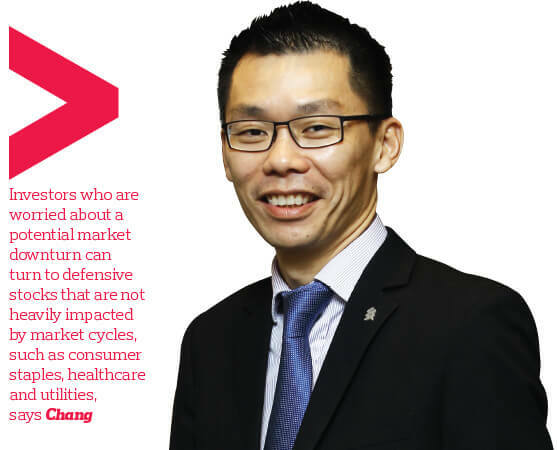 Danny Chang, head of managed investments and product management at Standard Chartered Bank (Malaysia) Bhd, says investors who are worried about a potential market downturn can turn to defensive stocks that are not heavily impacted by market cycles, such as consumer staples, healthcare and utilities. However, Inter-Pacific Securities Sdn Bhd CEO Lim Tze Cheng says investors should not adopt a defensive stance for the time being. Instead, they should focus on growth as it is too late to take advantage of attractive yields. “The average dividend in Malaysia now is barely 3%. Is it worth it at this stage? Investors should not turn to defensive stocks when there is uncertainty or fear in the market because at that point of time, the valuation of defensiveness has already been reflected and the yield would have dropped. They should be defensive when the market is hot and nobody is going into defensive stocks. Then, they can get a good dividend yield of about 6%,” he says. The US is still the most preferred region for equities. An all-time low unemployment rate and recovering consumer confidence have stimulated its economy, leading to higher corporate profit margins, says Chang. “We expect EPS growth in the US to be as high as 16%, which is pretty decent considering the size of the economy. Business investment has also picked up, leading to more mergers and acquisitions. This is always a good sign. No company will ever acquire or merge with other companies if they are not in a comfortable position,” he adds. While the earnings outlook for the rest of Asia remains robust, Chang says a sustained rally in the US dollar or further escalation of trade tensions between the US and China could pose growing risks to Asian equities. To balance the upside potential and downside risks, StanChart currently has a smaller allocation to equities in the region. “Asia’s 12-month corporate profitability growth projection is almost 13%, which is more than decent. However, there are headwinds. First is the expectation of three to four interest rate hikes this year by the US Federal Reserve. Naturally, when interest rates are expected to be higher, money will flow out of Asia as a result of investors holding on to the US dollar for a more attractive yield,” says Chang. Over the long term, however, StanChart remains bearish on the US dollar. Chang says the bank expects the currency’s short-term corrective rally to peak and re-establish its long-term structural decline. This will be driven by narrowing global growth and real interest rate differentials where central banks collectively begin to normalise policies and there is a renewed focus on the US’ budget and trade deficits, he adds. Meanwhile, on the home front, the FBM KLCI is at an attractive level as its PER is below its average valuation while its price-to-book (PB) is even more significantly undervalued, says Inter-Pacific’s Tze Cheng. The FBM KLCI was at 1,687.13 points on July 10, 5.3% lower since the start of the year. “Decent companies on the stock market have been down 30% on average over the past six to seven months. In this kind of environment, investors should not head to the safe stocks. They should look for big bargains and pullbacks,” says Tze Cheng. He adds that the recent shake-ups in government-linked companies are viewed as positive to the stock market in the long term as the changes are expected to make them more efficient. The fund house continues to favour the technology sector as it is the most resilient on an earnings basis. “Bursa Malaysia’s latest quarterly results have been underwhelming. However, if you look closely, you will see that the stocks that are holding on or are slightly positive are the tech companies. The others — consumer staples, telcos, you name it — every sector but tech is a total disappointment,” says Tze Cheng. As the Fed is expected to hike interest rates a few more times this year, fixed-income securities will continue to face the headwinds of rate normalisation, says UOB’s Suet Ling. The fund house expects US interest rates to be rangebound between 2.8% and 3.2%. “The asset class suffered negative returns in the first half of the year. But in the second half, we think there is potential for positive returns. We are seeing some value in certain bonds, especially the high-yield and Asian rated bonds. We also prefer hard currency bonds in the US dollar,” says Suet Ling. Meanwhile, StanChart’s Chang says the gradually rising yields across most bonds mean that income-oriented investors are able to achieve a better entry point than what was available in the last few years. However, the bank believes that corporate and EM government bonds offer more attractive prospects than developed market government bonds. Within EM bonds, StanChart prefers US dollar-denominated government bonds over local currency bonds. Chang is not ruling out the possibility of a trade war, even though he does not believe it will happen. If it does, a global stagflation scenario would likely take place, undermining global growth and putting upward pressure on inflation. In such cases, investors may turn to other asset classes, he says. “There is not much you can do at that point as neither equities nor bonds would do well. Some may turn to cash, but it is not a very smart move, they would have no shot at beating inflation,” he adds. However, some fund managers already have exposure to gold. Suet Ling says UOB is currently overweight on gold as a defensive play in times of uncertainty and may buy more during pullbacks. According to Bloomberg data, the gold spot price as at July 10 was US$1,253.42, down 8% from its January high of US$1,358.46. According to a July 10 market commentary by Stephen Innes, head of Asia-Pacific trading at Oanda, gold has a long way to go before it can breach the US$1,300 mark and remains prone to a stronger US dollar. Since the beginning of the year, market observers have given many reasons for why they think the market is reaching the end of the bull cycle. They include shrinking liquidity, historic debt levels and a narrowing yield curve. There are also geopolitical tensions in Europe, the Middle East and Asia, which could have huge implications if they are left to unravel. Nevertheless, Lim Suet Ling, CEO of UOB Asset Management Bhd, says the models and indicators that the fund house monitors for the likely end of the cycle are not giving any warning signals yet. “These indicators — which include yield curve inversion, the Fed probability model, financial stress, high-yield versus investment-grade spreads and market correlation spikes — are still ‘green’, which means we do not see any triggers to a recession yet. This year, Standard Chartered Bank (Malaysia) Bhd’s overriding theme is “turning up the heat”, with expectations of US inflation gradually picking up, says Danny Chang, its head of managed investments and product management. Aided by last year’s tax cuts and other incentives that are driving the pick-up in private investments, the US has emerged as the main engine of global growth while other major economies have slowed from last year’s above-trend levels. The trade war rhetoric remains a trigger, although Inter-Pacific Securities Sdn Bhd CEO Lim Tze Cheng does not believe it will happen. He says the US and China are just trying to strengthen their bargaining power. “US President Donald Trump is visibly unhappy that some US companies have started moving their production overseas due to the tariffs on steel and aluminium while China is unhappy about the US ban on chipmakers from selling to one of China’s biggest telecommunications players, ZTE Corp,” says Tze Cheng. Lim Chia Wei, portfolio manager at Affin Hwang Asset Management Bhd, says the trade war threat will be ongoing this year, especially towards November when the US mid-term election takes place. “Early this year, Trump noticed that his approval rating rose when he talked about the steel and aluminium tariffs. So, it is clear that many Americans loved it when he made trade threats. He has to keep doing this to keep raising his party’s popularity as the election approaches. True enough, the trade threat has escalated during the year. Apart from a potential trade war between the US and China, what are the other triggers that could lead to a recession? Last year, the three triggers were the geopolitical tensions between the US and North Korea, which have diffused to a certain extent; a cryptocurrency crash, which also did not materialise; and algorithmic trading, says Tze Cheng. “This year, algorithmic trading remains one of the triggers. It works on a very complex structure, with the servers easily costing more than US$100 million to be able to execute one million trades per second. What concerns me about the model is that nobody knows how big the market is. Even if you ask the US Securities and Exchange Commission, it cannot give you an answer. So, we do not know how big the impact would be should anything happen. There are also concerns that exchange-traded funds (ETFs) — one of the most popular asset classes over the past few years — may trigger the next market crash. This asset class, which has grown rapidly over the years has turned many illiquid assets into liquid products available to the everyday investor, putting investors at a higher risk. 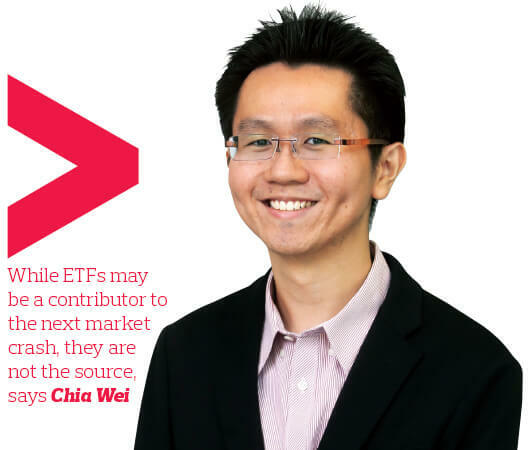 According to Chia Wei, while ETFs may be a contributor, they are not the source. “For example, high-yield-bond ETFs contribute to the high valuations in the bond market. Some ETFs, such as the long-index-equity ETFs, are alright and do not pose any serious problems,” he says. “The ones that are problematic are those that try to be too funky, such as the smart-beta ETFs, which try to predict what kinds of stocks would do well. They tend to change strategies and asset allocation from time to time. StanChart’s Chang says oil prices are also something to keep an eye on. Brent Crude is currently trading at about US$79 a barrel. On July 10, UK-based Barclays said it expected Brent Crude to see an average of US$71 a barrel next year while S&P Global Platts Analytics forecasts a range of US$75 to US$80 a barrel for the next 18 months. If oil prices continue to creep up due to geopolitical factors or supply restrictions by the Organization of the Petroleum Exporting Countries (Opec), global growth may be impacted. “If oil becomes expensive and stays expensive, economic activity will slow down, growth will slow down and the stagflation scenario will take place,” says Chang. Trump recently pushed to cut off 2.4 million barrels of Iranian oil while admonishing Opec to keep prices stable. The White House’s zero-tolerance policy on Iran is supporting oil markets, given the fragile state of global supplies as spare oil capacity hovers near zero. According to Stephen Innes, head of Asia-Pacific trading at Oanda, this scenario will only lead to oil prices moving higher over time. On July 6, investment management firm Sanford C. Bernstein & Co issued a statement suggesting that the lack of reinvestment in oil production could lead to a price spike. According to its analyst, investors who had egged on management teams to reign in capital expenditure and return cash will lament the underinvestment in the industry. Any shortfall in supply will result in a super-spike in prices, potentially much larger than the US$150 a barrel spike witnessed in 2008, it says. On the home front, the heavy sell-off since the general election has had investors worried about their holdings. According to a July 9 fund flow report by MIDF Research, the cumulative year-to-date outflow from Malaysia as at July 6 stood at RM7.53 billion net. Tze Cheng says this is nowhere close to 2015’s foreign outflow, which was RM19.7 billion. However, he says local investors should not be too concerned as foreign funds are no longer major players in the market. “As of last year, foreign funds constituted about 23% of the total market. We did our own calculation. Companies such as Fraser & Neave Holdings Bhd and British American Tobacco (M) Bhd are owned by foreigners. These investors do not want to sell their shares and they do not trade. Their holdings could easily be 10% of the stock,” he adds. Chang is optimistic about the outlook for the local market. “I think we have to take two steps back before we can move three steps forward. Let me give you a perspective. In 1980, we ran a deficit as big as 16.8% of the country’s gross domestic product. Tun Dr Mahathir Mohamad, who inherited the deficit, turned it into a surplus for five consecutive years before the 1997/98 Asian financial crisis,” he says. In times of uncertainty and volatility, fund managers recommend the long-short strategy, where investors buy equities that are expected to increase in value and short-sell equities that are expected to decline in value. Lim Suet Ling, CEO of UOB Asset Management Bhd, recommends that investors allocate a small portion of their portfolio to hedge funds, which are typically associated with this strategy. She says the ability to short-sell enables hedge fund managers to profit when the market falls, thus matching or exceeding the market. “Apart from providing diversification, investors also benefit from the downside mitigation. The higher alpha also helps to mitigate any beta drawdowns,” she adds. Danny Chang, head of managed investments and product management at Standard Chartered Bank (Malaysia) Bhd, also recommends this strategy. He points out that there are fund managers who can help retail investors implement this strategy as it is available in Malaysia in the form of funds.